Cardholder initiates payment from merchant web store and submits credit card details. Merchant submits data from the sale to FAC’s gateway over a secure connection. 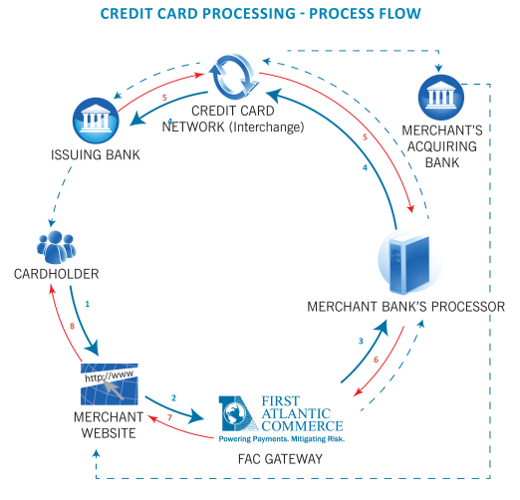 FAC formats the data and passes it to the merchant bank’s processor via a secure connection. The merchant bank’s processor submits details to the credit card network (Visa & MasterCard interchange), which routes the transaction to the bank that issued the customer’s credit card (Issuing bank). Interchange then sends transaction results to merchant bank’s processor and processor relays results to FAC. The issuing bank then sends the funds to the credit card network, which passes those funds to the merchant’s bank (acquiring bank). The bank deposits or “settles” the funds into the merchant’s bank account.